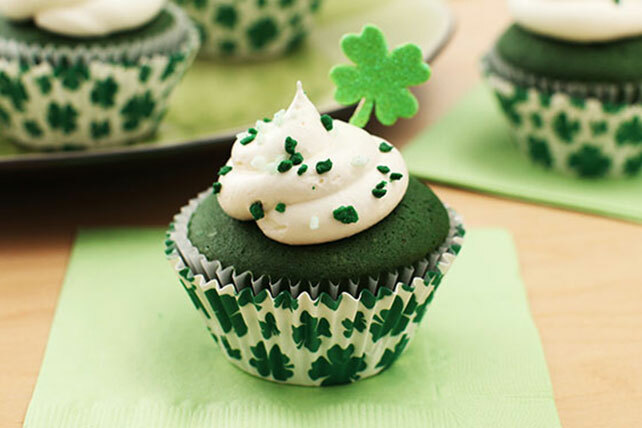 Celebrate St. Patrick's Day with tasty Green Velvet Cupcakes! Top your Green Velvet Cupcakes with some COOL WHIP Whipped Topping to finish off the treats. Beat cream cheese, marshmallow creme and vanilla in large bowl with mixer until blended. Add COOL WHIP; beat just until blended. Spoon COOL WHIP mixture into resealable plastic bag. Cut corner off one bottom corner of bag; use to pipe COOL WHIP mixture onto tops of cupcakes. Top with sprinkles. Prepare using red or blue food coloring. These colorful cupcakes with their built-in portion control are perfect for sharing at a party.